Having emphatically avoided a potentially embarrassing cup exit to Boreham Wood last week, attention turns back on the league, and finally mounting the kind of run to put ourselves into genuine promotion contention. Like many of our wins this season, the performance against Boreham Wood was hardly a complete one, but we clicked at the right moments in order to ensure victory. Given our strength at the back, we don’t need to control games and pummel the opposition with shots, however, that lack of consistent attacking fluency has often left us struggling for ideas when our opponents are capable of nullifying our plan A. Mark Robins will be hoping that the line-up of the attack deployed against Boreham Wood is one that can solve the problem of what to do without Jodi Jones. 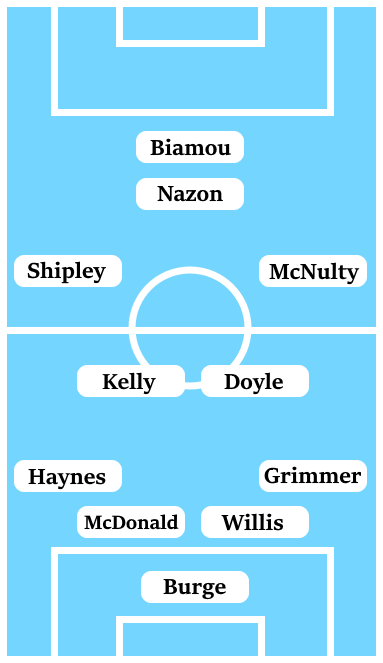 Maxime Biamou as the focal point in attack played an important role in allowing Duckens Nazon and the, now in-form, Marc McNulty to get into the game, while Jordan Shipley on the left-wing looks to be further staking his claim for a regular spot in the starting XI. However, it is an attacking solution that involves playing either Nazon or McNulty on the wing, which could run into issues. Fitness issues surrounding Liam Kelly and Rod McDonald are the main selection issues for the rest of the side. While Ben Stevenson has shown in the past couple of games that he has a role to play as a ball-playing central midfielder, Kelly’s experience and solidity could prove invaluable in this potentially bruising upcoming game against Morecambe. As far as McDonald’s concerned, Tom Davies’ recent performances have shown that we can get by without him for the odd game. Our most recent meeting with Morecambe came in the FA Cup last season, back in the days when we were still muddling through with Mark Venus. We were probably lucky to come away from the Globe Arena with a replay, with Jamie Sterry scoring a late equaliser, but made relatively light work of Morecambe at the Ricoh Arena, despite falling behind early on, with Marvin Sordell (remember him?) scoring twice. Morecambe are famed at this level for starting the season strongly before falling off the rails over the course of the campaign. This season, they’ve failed to start the season in anything resembling decent form and the worry is that they’ve lost an important cushion to avoid relegation that they’ve usually been able to depend upon. They are also a club in a dire financial situation, following a ‘takeover’ by a mysterious Brazilian businessman last summer which turned out to be too good to be true. While things looked to have settled down from the parlous state they were in last season, Morecambe’s manager, Jim Bentley, recently revealed that the club has been struggling to find a regular venue for training. Bentley though is a manager well-accustomed to working with meagre financial resources, and has generally turned to a core of veterans to keep his side going. Target-man/winger Kevin Ellison sums up this Morecambe side, now at the age of 38, Ellison continues to produce the goods and is their leading goalscorer this season. 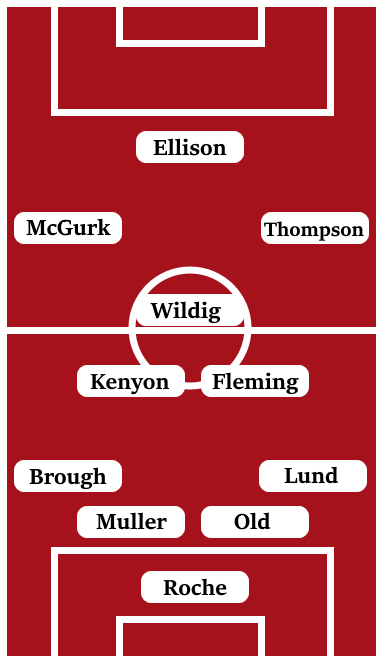 There is further experience in attack in the form of Garry Thompson (not the one that played for us in the 80s) while the talented but inconsistent Adam McGurk offers some spark to an otherwise functional team unit. However, Morecambe have struggled badly for goals this season – they are the division’s lowest scorers – which is another worrying sign for the club as under Jim Bentley, they have had a reputation for scoring loads and struggling to keep it tight at the back. However, that trend has brought the benefit that Morecambe have been better than usual in defence this season, regularly deploying a back three/five – although injuries and suspensions mean they may lack the personnel to utilise it for this fixture. Summer signings Sam Lavelle – suspended by the FA for this game for ‘deceiving a match official – and Steven Old have added defensive steel to an experienced unit with their 35 year-old goalkeeper, Barry Roche, enjoying a good season as well. Elsewhere, former Cardiff City youngster Aaron Wildig has consistently been a class act in midfield for Morecambe over the past few years. A box-to-box midfielder with a bit of quality on the ball, he is probably one of the few players in this side who could do something at a higher level. I’m not particularly worried about this side this season not being able to deal with a physical tussle on a difficult away day, we have typical thrived in these kind of fixtures this season. It’s all about whether we can put away the chances we’ll inevitably get in this game, but it appears that Duckens Nazon and Marc McNulty have come into decent form over the past few weeks, so I’m confident about us in that regard too. Put simply, I expect us to win this game. I doubt it will be a classic, but I think we’ll get the job done, by a 1-0 scoreline.